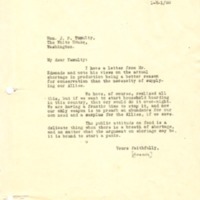 I have a letter from Mr. Edmonds and note his views on the actual shortage in production being a better reason for conservation than the necessity of supplying our Allies. We have, of course, realized all this, but if we want to start nhousehold hoarding in this country, that cry would do it over-night. We are having a frantic time to stop it, and now our only weapon is to preach an abundance for our own need and a surplus for the Allies, if we save. The public attitude on food is a delicate thing when there is a breath of shortage, and no matter what the argument on shortage may be, it is bound to start a panic. Hoover, Herbert, 1874-1964, “Herbert Hoover to Joseph P. Tumulty,” 1917 November 1, WWP19241, Hoover Institute at Stanford University Collection, Woodrow Wilson Presidential Library & Museum, Staunton, Virginia.